Further, brothers Gary and Sam Bencheghib took to the mighty waters of Newtown Creek in their series #BroCleanBKLN. 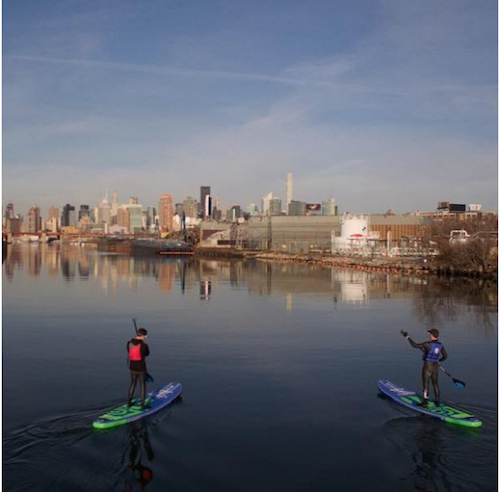 On December 2nd, the pair paddled both the Creek and Gowanus Canal to highlight pollution in Brooklyn, and advocate for cleaner waterways. And, it’s clear that in Brooklyn, some advocacy pays off! Advocates opposed to the rezoning of Brooklyn’s Broadway Triangle area, which critics charged unfairly favored large Hassidic families in the affordable housing developments, have scored a victory. The City settled a lawsuit with advocates to ensure that affordable housing in the area will be open to all those in need, of all faiths, ethnicities and backgrounds. If you want to take your community engagement to the state level, it’s important to know that we have new representation in the State Senate. Brian Kavanagh is now our man in Albany, representing the Brooklyn waterfront from Greenpoint to Carroll Gardens as well as lower Manhattan. And speaking of new things on the Waterfront, there’s a new site specific art installation at the Lot Radio (17 Nassau Avenue).